This chromolithograph is taken from plate 5 of William Simpson's 'India: Ancient and Modern', and shows boats ferrying cotton bales on the Ganges, the sacred river of the Hindus. 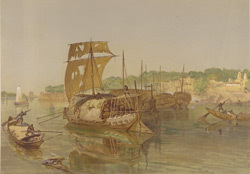 The river was the first transport route for European armies and families arriving in India. They travelled on keelless barges called budgerows, which were cargo boats once described as "haystack[s] perched upon a barge", adapted to include cabins and Venetian shutters. Simpson wrote that they were comfortably fitted and provided a lazy, luxurious mode of travelling, a bit tedious if one was in a hurry. But the travellers saw more of Indian scenery, people and customs, and acquired a greater knowledge of the country than could be gained by years of railway travel.